The Ohio Nursery and Landscape Association (ONLA) hosted 250 high school students from across Ohio for the second annual Ohio High School Landscape Olympics on Nov. 2 and 3, at Ohio State University Agricultural Technical Institute (OSU ATI) in Wooster, Ohio. 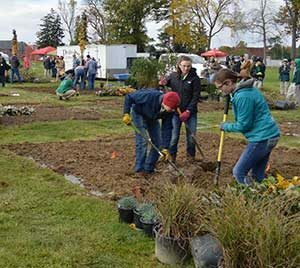 Ohio high schools and career centers with horticulture programs were invited to participate in the Landscape Olympics, an educational competition where students tested their skills and learned more about careers in the green industry. Students from 20 schools competed in 10 events in the afternoon on Thursday, Nov. 2, and throughout the day on Friday, Nov. 3. Festivities began with a pizza party on Thursday afternoon welcoming the students. A career exploration event with more than 25 companies gave students the opportunity to meet with green industry leaders and learn more about careers available to them in the industry. The event ended with an awards ceremony on Friday afternoon. Click here to see the 2017 medalists, participating schools and event sponsors. Growing Your Business with Jeffrey Scott: Competition is Great—When You Harness it!